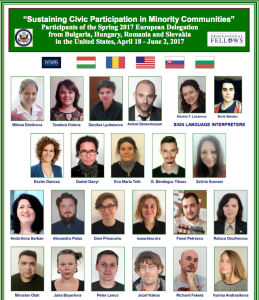 The first delegation with a total of 21 fellows from Bulgaria, Hungary, Romania and Slovakia will visit the U.S. from April 18- June 2 2017 to participate in seminars, round-table discussions, site visits, and will have interactions with U.S. leaders. A 4-week tailored internship with mentoring, multicultural events and participation in volunteer activities as well as in the Professional Fellows Congress in Washington, D.C. will be also included in the 6-week professional fellows program. Participants will prepare a 6-to-9 month individual Action Plan for follow on activities. They will have various opportunities to experience the American family life and the diversity in the U.S. through staying with American host families during their internship in Chicago (Illinois), Port Clinton (Ohio), New York City, Albany and Rochester (New York), Philadelphia (Pennsylvania), Charlotte (North Carolina), Albuquerque (New Mexico), Silver Spring (Maryland), Charleston (West Virginia), and in Washington, D.C.
A second European delegation is expected in the U.S. from October 4-November 17, 2017. 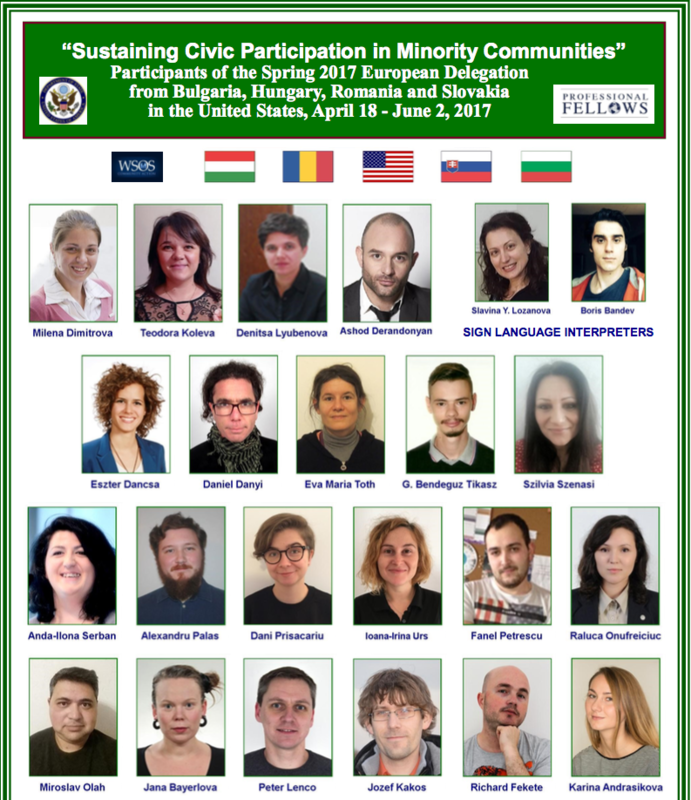 The Out-Bound component is schedule for summer 2017 when American Mentors who hosted the spring 2017 fellows will travel to Europe (for up to 2 weeks for each mentor) to provide joint workshops with the alumni and on- site consultation to help implementing new projects. Web-based technology, social media, and public outreach efforts will strengthen the identity of the Professional Fellows Program and lead to wider alumni and international networking and collaborative projects.